1) 66 bug, tow bar with 1 7/8 ball. When I tow this bug, it seems like there is a lot of slack in the system so when I'm pulling it, there is a lot of clunking and jerking going on. Is this normal?!?! 2) I was told that you cannot back up with these tow bars, it that true? 3) Where the tow bar connects to the axle, I notice that there is a bit of extra space and can slide each direction (just a bit). Is this OK? Should you grease this area? there will be some clunking and jerking. some worse than others. Never ever back up any car that is being flat towed!! The VW bug Tow bar will Bend even if you back up a few inches. 3) Where the tow bar connects to the axle, I notice that there is a bit of extra space and can slide each direction (just a bit). Is this OK? When the tow bar is new it very tight and hard to put on as you use the tow bar it will bend an get loose to the point you will need to replace or repair it. Should you grease this area? I never grease that area... sounds like it just make a mess. fokes that care about the paint on the beam don't tow bar there cars. Always use a safety chains no matter how far you are towing. lights are good. ... not having them will get you a ticket in some states. putting up a "Car in Tow" in the back window ... just helps inform the really stupid people that the car behind you is not a tailgater. after everything is hooked up.. I always start the tow car and then get out of the car and turn the key just to the point that the motor turns off. then walk away. 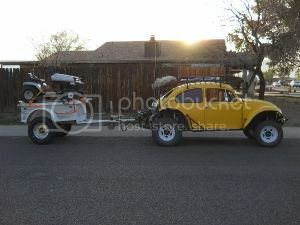 I know of one VW bug and one VW thing that have exploded there motors by leaving them in first gear then towing them. the Bug was not that bad when the motor went it locked up and they stopped right a way with little damage to the body..
the Thing on the other hand was a different story... I only saw picture of the damage but it looked like parts kept flying around in the back,,, beating the hell out of the back of the car.. most the block was gone. the . Part of the trans was gone. it was the most ugly thing I have ever seen... I would pay good money to see it blow up like that. the thing was being pulled behind an RV... the driver never knew . I think about that every time I flat tow my Baja behind my RV.